The March payroll employment data showed that the decline in employment from the peak in December 2007 is now larger in percentage terms than the decline in the worst recession since 1960, in 1981-82. The plot below shows, however, that the decline is small in comparison to Depression. 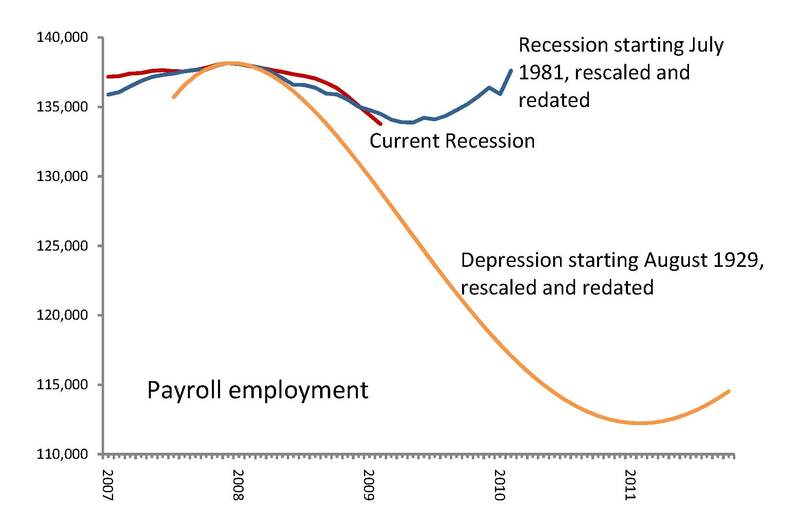 The government did not collect monthly employment data during the Depression, so we have fitted a smooth curve through the annual data. The peak before the Depression was in August 1929, according to the NBER. Originally published at Woodward & Hall weblog and reproduced here with the author’s permission. 6 Responses to "Employment decline compared to Depression"
Where is confidence? What does mom do with the spit? Wipe it up. Then feed another spoonful of mashed peas.It might take longer than expected. The results will not be as rosy and as soon as the big baby Rush would like. But someone has to plug in the pacifier into this man’s dirty mouth and his bad attitude which is very, very anti-AMERICAN.Long live freedom, not a person who wants to squash it. Rush Limbaugh is a depression. Rush and the past 30 years of de-evolution have depressed ME (and the economy)…I don’t think things will improve any time soon. So much stress, so much heartache for our children…Arrgh. Hogwash.That graph is using the U-3 (now 8.1% unemployment) for the current period.The ’30s data on unemployment was NOT kept in the same manner and was much more inclusive. It counted all those ‘discouraged workers’, ‘under-wmployed workers’ and all the rest. The closest current methodlogy to that of the ’30s is the U-6.Try doing the graph again but use the U-6 for now and the 80s instead of now.Honestly, you people should know better than that! The difference in methodologies was covered in my 3rd econ class about labor economic s 30+ years ago! Mish Shedlock has a post up now (3/13) discussing how unemployment as measured in the 1930’s was most similar to our U-6 number.This would imply that the current levels of unemployment are higher than they were during the Great Depression!